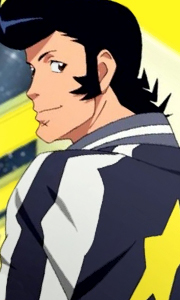 Space Dandy is a dandy in space! This dreamy adventurer with a to-die-for pompadour travels across the galaxy in search of aliens no one has ever laid eyes on. Each new species he discovers earns him a hefty reward, but this dandy has to be quick on his feet because it’s first come – first served! Accompanied by his sidekicks, a rundown robot named QT and Meow the cat-looking space alien, Dandy bravely explores unknown worlds inhabited ..
Own Space Dandy Season 1 DVD from Deff, DVD, Blu-Ray & 4K Video Specialists - Free UK Delivery..
Own Space Dandy Season 2 Blu-Ray from Deff, DVD, Blu-Ray & 4K Video Specialists - Free UK Delivery..
Own Space Dandy Season 2 DVD from Deff, DVD, Blu-Ray & 4K Video Specialists - Free UK Delivery..
Own Space Dandy Seasons 1 to 2 Complete Collection Blu-Ray from Deff, DVD, Blu-Ray & 4K Video Specialists - Free UK Delivery..
Own Space Dandy Seasons 1 to 2 DVD from Deff, DVD, Blu-Ray & 4K Video Specialists - Free UK Delivery..